Eissenberg's PhD is in Experimental Psychology, and his "primary area of research is the behavioral pharmacology of drugs of abuse, focusing primarily on nicotine/tobacco." Ossorio's PhD is in Microbiology and Immunology. So that's four new members with background in biomedical research of one kind or another, none whose primary interests are in non-medical research. The June 2012 issue of Research Ethics features four responses to my December 2011 essay, "The Case Against Ethics Review in the Social Sciences." Three scholars based in Canada wrote a joint response, while three in Britain wrote individual replies. I am grateful to all of the respondents for their attention, kind words, and challenging critiques. Since the responses overlap somewhat in their themes, I think it best for me to respond to them collectively. Will C. van den Hoonaard, author of The Seduction of Ethics, is organizing a conference to be held next month in Fredericton, New Brunswick, entitled "Ethics Rupture: An Invitational Summit about Alternatives to Research-Ethics Review." Could Guidance and Feedback Replace Rote Compliance? Murray Dyck and Gary Allen, both of Griffith University in Australia, argue that "the review process should be an advisory and collegial one—not one that focuses on compliance, enforcement and gatekeeping." 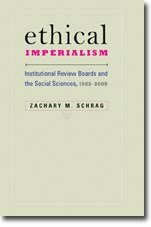 Contemporary Sociology has published my review of Will C. van den Hoonaard's Seduction of Ethics, which I term "a powerful, combined-arms assault on the system of ethics review of the social sciences." The American Association of University Professors has posted "Regulation of Research on Human Subjects: Academic Freedom and the Institutional Review Board," a report prepared by a subcommittee of the Committee A on Academic Freedom and Tenure. I served on that subcommittee, which was chaired by Professor Judith Jarvis Thomson of MIT. In July 2011, the federal government took what may be the first step toward the most substantial change in the regulations since 1981, issuing an advance notice of proposed rulemaking, or ANPRM. More than 1,100 individuals and associations have submitted formal comments. The AAUP report notes that “out of respect for liberty, it is normally expected that government regulation of behavior will consist in listing what is forbidden, all else being permitted.” The report goes on to suggest ways in which the regulations could be rewritten along these lines. The Association welcomes comments on the report through September 28.